Tags are unique identifiers that can be associated to your CRM records to search, sort, categorize, filter, and segment records in a more efficient way. It is usually like adding keywords or any additional information to any record in CRM. For example, there may be few Leads in your CRM account that requires high priority. 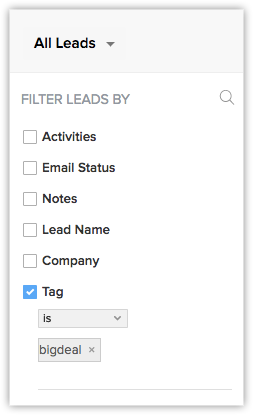 You can tag those Leads as Important, so that you can easily filter them from the other Leads in your CRM account. Tags in Zoho CRM are specific to each module. You can add unique tags to each module based on your requirements. Also, tags are usually made public and can be accessed by all the Zoho CRM users. Profile Permission Required: Administrators and profiles with Module Customization permission can manage tags. Administrators can set profile-wise permissions for other users to add/associate tags Also, admins can define to which module the associated users of that particular profile will have access to tags. Tag your records based on the relationships they have with your business. For example, a record can be a lead, a vendor, or a partner. Categorize those records using multiple tags and sort or filter them whenever required. Tags can be based on demographics such as location, revenue or company size. You can add various tags such as US, UK, Asia, size 50-100, Enterprize, billion-dollar, small-scale, etc,. This will be useful for the sales reps who deal with contacts from a particular region or while following up with a big deal that should be given higher priority. Add tags based on the Lead source - You can tag your records based on the source in which they have been created. For example, you may capture leads from different business units or trade shows, or you may have a database of contacts, or capture leads/contacts through your websites. In that case, you can tag them as trade show, website leads, imported leads, and so on. Tag records that has to be contacted on specific criteria. For example, you may require to contact a lead via email or phone or based on best time to contact them. Based on the required criteria, tag them as contact via email, contact via phone, contact morning, and so on. Add tags based on products - You may run a business with multiple product lines. A lead or contact may be interested in all or specific products and services that you offer. Segment those records based on the product or service they are interested in. 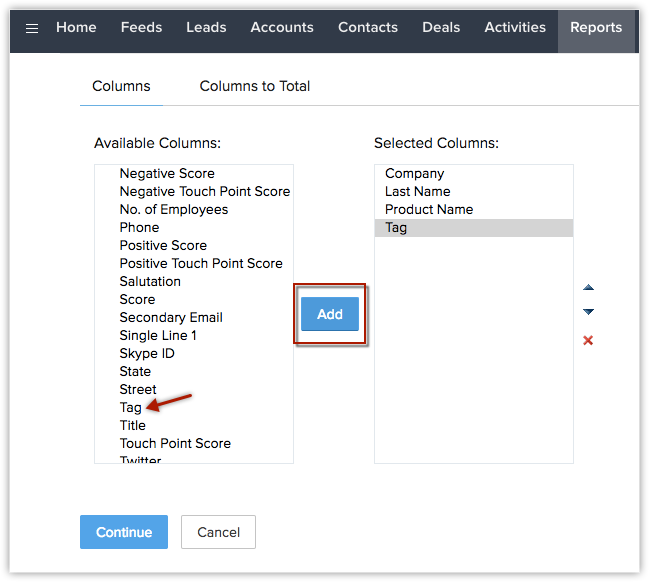 Create tags based on different stages of a lead in your CRM. This helps you to segment your leads and communicate with them in a better way depending on the stage of the lead. Easily search records using tags. You can either use global search or categorize the required records using advanced filters. You can also search and find various other data tagged by other CRM users. All tags are publicly available to all users. Tags are made public in order to reduce tag clutter and avoid duplicates. Make sure you add meaningful names for your tags, since it will be easy while you search, create or edit information. You can carry over tags while converting records, so that the related records can be searched. Since, tags are public and accessed by all CRM users, we have limited the number of tags that can be created in your CRM account. This will avoid creation of too many tags and reduce duplication. The following table shows the number of tags that can be created for each record and for each module based on different Zoho CRM editions. Zoho CRM allows creating users and defining permissions for each profile as needed. You can manage and customize these profile permissions anytime based on your requirements. Under Module Permissions, you can define to which module the associated users of that particular profile will have access to tags. Go to Setup > Users & Control > Security Control > Profiles. Choose any available user profile or create new profile. Under Module permissions, click Others. Select the required modules, where the user is allowed to view, add and manage tags. 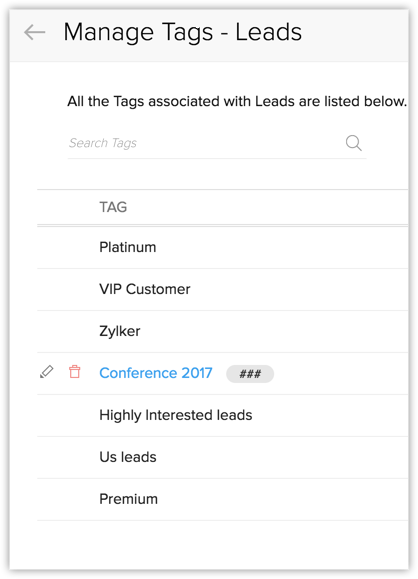 Tags in Zoho CRM are usually easy to create. 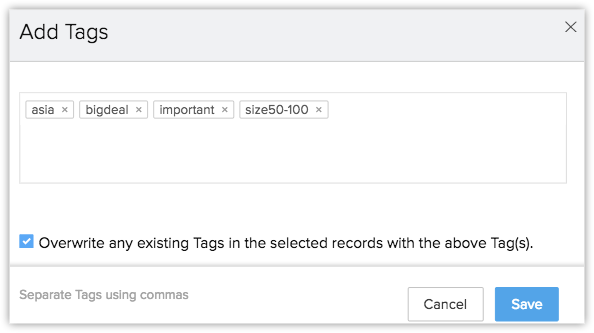 Tags are not just a simple category, they can be more powerful, since you can add multiple tags to a single record. 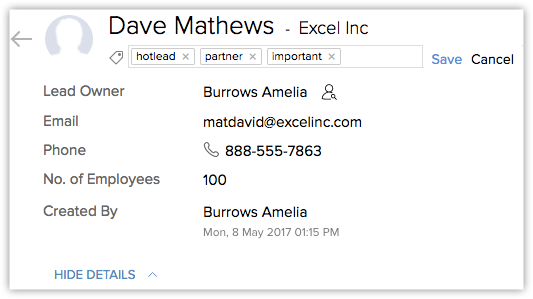 You can also create tags in multiple locations in your CRM account, if required. Add tags as instant actions through workflow rules. 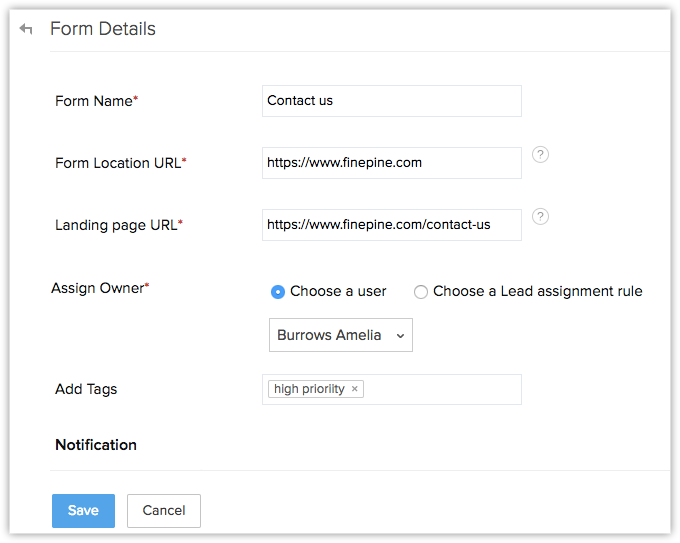 Once a record is created in your CRM, you will able to add new tags to them. Choose any record, in which you want to add Tags. Click Add Tags in the record detail page. Add relevant Tags and click Save. You can also click on any tag to view the records associated to that particular tag. 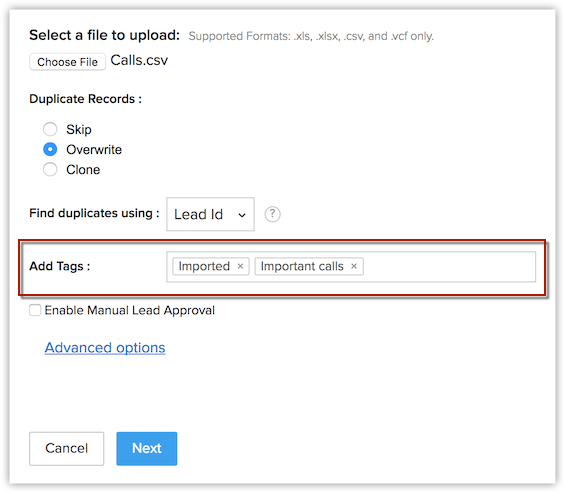 You can add multiple Tags to multiple records as a single action in your Zoho CRM account. Choose the module (such as Leads, Contacts, or Deals), where you want to add Tags. Select all or multiple records based on your requirements. Now under the Tags dropdown, select the Add Tags option. You will be shown tag suggestions (list of existing tags will be shown) everytime when you add tags in your CRM account. Once saved, the Tags will be added to all the records that are selected in the List View page. Add tags while you import records into your CRM account. For example, if you have a CSV file with few Leads data that you got from a US tradeshow, tag them as leads from US tradeshow, so that it will be easy to categorize those data in future. Choose the module where you want to import records. In the import data page, you will find an option to add tags to the records imported. All relevant tags and click Next. Go to Setup > Marketplace> Web Forms. You will have an option to Add Tags, while creating a webform. Add Tags based on your requirements and click Save. The relevant tags will be added and associated to the records created via the related web forms. In Zoho CRM, Workflow Rules are a set of actions such as alerts, tasks and field updates, which will be executed when certain specific conditions are met. See more about creating workflow rules here. 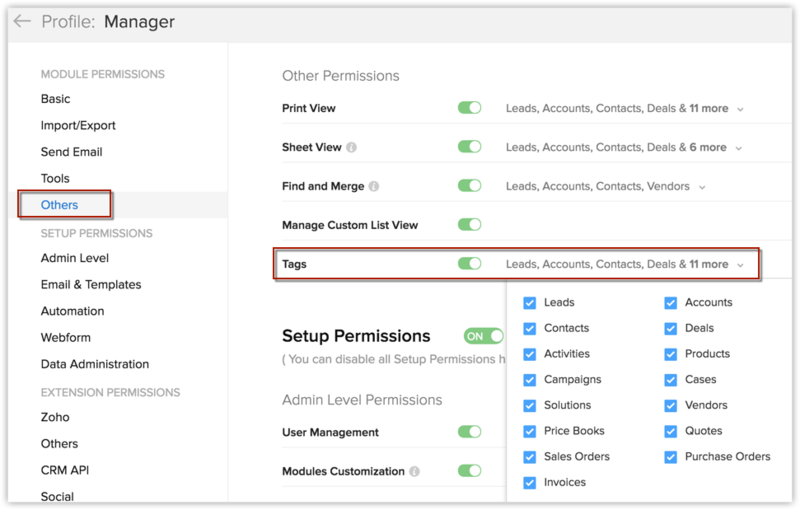 You can add tag as an Instant Action while creating workflow rules in Zoho CRM. For example, if you're setting up a Big deal alert rule, you can create an action to add tags like bigdeal, hotdeal, probability100%, etc., Whenever the workflow rule is executed with the specified criteria, the respective tags will be added to the record automatically. Please note that, the tags will be added only till the maximum limit allowed and if there are existing tags, new tags can be added only till the specified limit (See tag limits). Go to Setup > Automation > Workflow Rules. In the Workflow Rules page, click on the rule for which you want to create an instant action. Click Edit to modify the rule settings. Whenever the rule criteria is met, the relevant tags will be associated to the records automatically. Blueprint in Zoho CRM is an online replica of your offline business process. It helps you to automate routine actions and guide your team members through the entire execution of your business process. Read more about Blueprint here. While designing your blueprint, you can define actions to be automated at the completion of your transition. These actions will be automatically executed when specified criteria is met. Learn more about blueprint transition settings here. 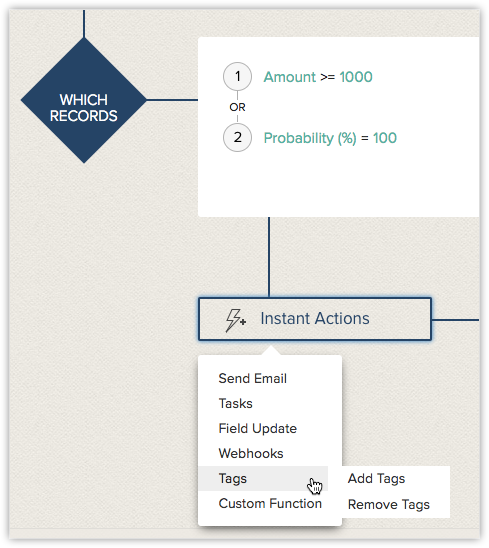 You can add tags as one of the actions to be automated in your business process. 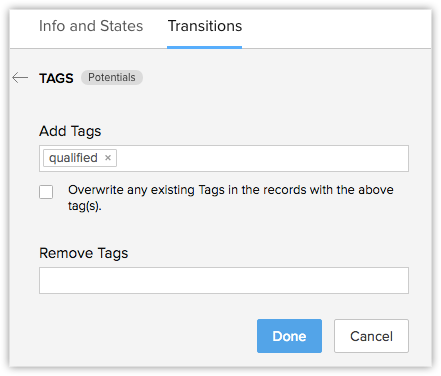 For example, a "qualified" tag can be defined in the transition for a deal in qualification stage. Whenever a deal is in qualification stage, the relevant tags will be associated to the deal record automatically. Please note that, you can add tags will be added only till the maximum limit allowed and if there are existing tags, new tags can be added only till the specified limit (See tag limits). 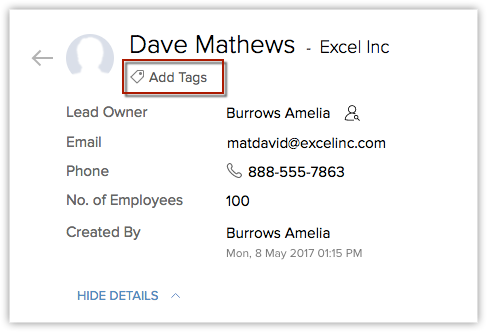 While adding tags to your records in CRM, you can choose to overwrite the existing tags with new tags. For example, you may require to add a set of relevant tags for particular actions through workflows. If there are few existing tags and are not relevant to that particular action, you can overwrite them with new tags, if necessary. Overwriting tags will replace all the existing tags with the newly updated tags. Also, you can overwrite tags only while adding them via blueprint, workflows and to multiple records. Tagging in Zoho CRM helps you easily search relevant CRM records. You can generate a list of records you're looking for by searching records with tags. For example, you want generate a list of contacts that you acquired from a sales event organized by your company to send an email campaign. You might have imported these contact records in the past and tagged them with relevant names, say for example, US sales event March. You can perform a global search with the tag name and list of records will be displayed instantly, thus saving your time. Also, filter tags using custom views and perform a module-specific search (using advanced filters) based on your requirements. In Zoho CRM, you can create custom list views by defining criteria based on your requirements. Specify Tag as your criteria to filter records based on the tags that you have created for that module. 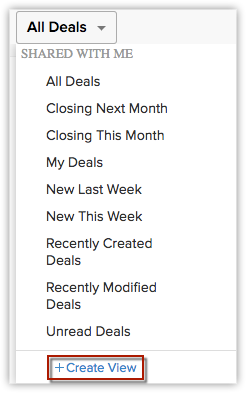 For example, if you want to view records that are tagged as Big Deal in your Deals module, create a custom list view based on that criteria and filter only those records. In the [Module] List View page, click the list view's drop-down. Choose Tag from the dropdown and define the required criteria. See also Custom list views, for more details. Log in to your Zoho CRM account and enter the required tag names in the global search menu. The records or other related information matching the search name will be displayed. 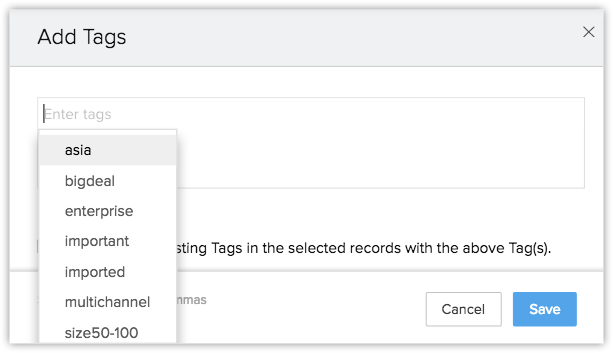 Once you have created Tags to various records, you’ll be able to filter the records based on those Tags in the List View page. Choose Tags from the available filters and enter the required tag name. For example, if you have created a tag named 'bigdeal' and if you filter using that tag name, the records related to that particular tag will alone be displayed, making it more easy for you to perform a module-specific search, thus saving a lot of time. In Zoho CRM, you can convert your qualified leads to contacts, accounts and deals. If you have added tags to these records, you can choose to carry over these existing tags, so that the related records can be easily searched using the relevant tag name. Also, you can reuse them whenever required. You can also carry over tags while converting a quote to salesorder and invoice. You can also carry over tags while mass converting leads. In Zoho CRM, you can create real-time fully customizable reports in all the modules with flexible options, including cross-linking modules and 3-level column grouping (Know more about creating reports). You can create reports based on the tags associated to your CRM records. Also, use advanced filters to filter out records based on the tags associated. In the New Report page, select the primary module from the drop down list. You can also choose the corresponding cross-functional modules from the Related Modules list box. Now select the report type. You can create only tabular and summary reports based on tags. Under Report Representation, choose Tag as the report column and click Add. Now specify the search criteria under standard and advanced filters. You can choose to filter records based on tags under the advanced filters section. The report based on tags will be generated. In Zoho CRM, tags are module-specific. Find the tags associated to each module and manage them whenever required. You can choose any module where you want to manage tags and start adding new tags, or edit and delete the existing ones from the available list. Please note that, profiles with Manage Customization permission can only manage tags. Click More option in the module's list view page. Say for example, Leads module. All the tags associated with the Leads module will be displayed in the Manage Tags page. You can either choose to edit, delete or add new tags based on your requirements. Click +Add New Tag to add a new tag to the Leads module. The newly added tag can be used in the future to associate with any record, if needed. Click Delete icon to delete any tag from the module. Click Edit icon to rename the tag and click Save. To merge similar tags, simply go to the Manage Tags section of a module and Edit a tag. 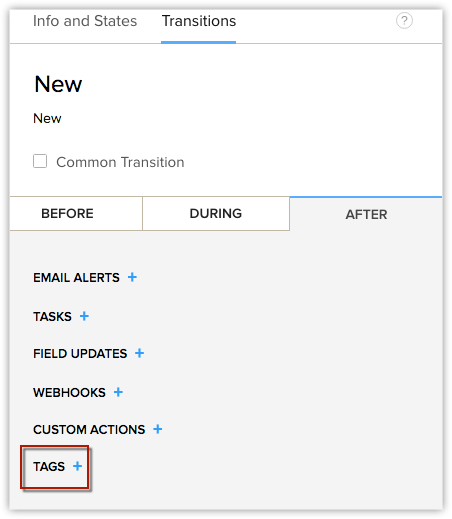 When you update the tag name to an existing tag, CRM will throw an alert, "Tag already exists. Do you want to merge this Tag?" Click Yes, Merge. The two tags will be merged and reflected across associated records in the module.